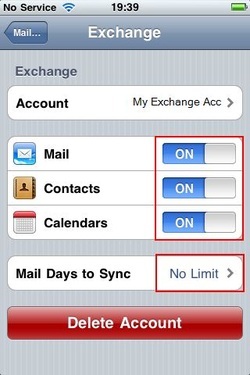 When you configure a device to sync with Exchange, you will be asked if you want to keep existing calendar on the device or remove it. Additionally, iTunes will no longer sync contacts and calendars with your desktop computer. However, you can still sync your device wirelessly using MobileMe services. 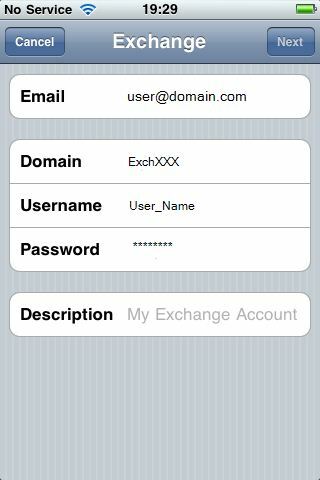 3.Enter the account information, then tap Next. Note: Optionally you can enter the Domain and the Username. Note for older iPhone versions: If you have iPhone 2.0 or earlier, you need to use the format Domain\Username in the Username field, and leave theDomain field blank. We recommend updating to the latest version of the iPhone operating system. 4. The device will try to configure the Exchange server address automatically. The iPhone, iPad and iPod Touch support Microsoft’s Autodiscovery service, which uses your username and password to determine the address of the front-end Exchange server. 5. If the server address can’t be determined, you will be asked to enter it. 6. After the Exchange account is successfully configured, the server’s passcode policies are enforced. If the current passcode doesn’t comply with the Exchange ActiveSync policies, you will be prompted to change or set the passcode. The device won’t communicate with the Exchange server until a compliant passcode is set. 7. 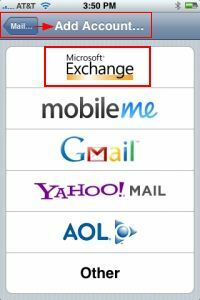 Next, the device offers to immediately sync with the Exchange server. If you choose not to sync at this time, you can turn on calendar and contact syncing later in Settings > Mail, Contacts, and Calendars. 8. To complete the setup process, tap Save and wait for the iPhone to test your incoming and outgoing mail settings and connect to your mailbox.